The Japan Aerospace Exploration Agency is to be born on October 1, 2003, merging the Institute of Space and Astronautical Science (ISAS), the National Aerospace Laboratory of Japan (NAL), and the National Space Development Agency of Japan (NASDA). The official English name, "Japan Aerospace Exploration Agency (JAXA)", represents our enthusiasm not only for exploration but also for broader activities including research and development by the use of the word "exploration". In the new logo, "A" for "Aerospace" is designed as a star to symbolize "hope", "pride", and an "exploratory mind", and to signify a guidepost pointing to our future. 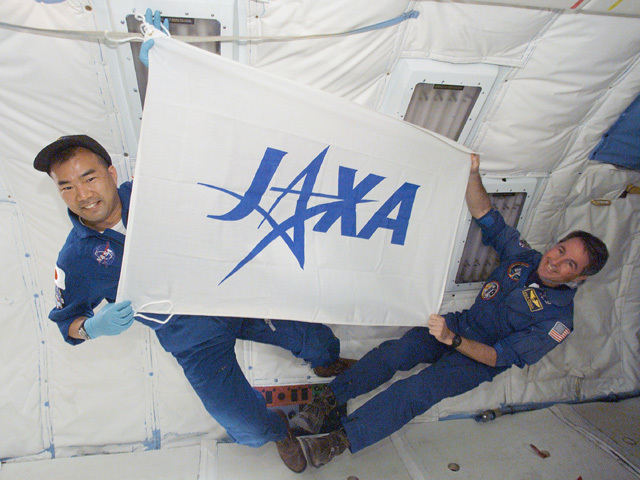 It reflects our hope for JAXA to be a star of Japan and for all of human society, as well as to shine brightly. In following photo, it seems as if Japan's first spacewalker is holding the flag and quite clearly here, while romping about during a training flight. Kibou (Hope) is the name of the Japanese module of the International Space Station (not yet launched due to the interruption in Shuttle flights, I think). JAXA also has a small manned shuttlecraft named HOPE-X in development, designed to be launched on the H-2 booster. A white paper airplane flying on the red sun and the Japanese character Hiragana "Kibou" meaning "Hope" is written on the flag. The rounded blue square w/ red sun and paper airplane emblem is or has been also used as a spacesuit patch, among other things: see image at JAXA.